Chromatin is a complex of macromolecules composed of DNA, RNA, and protein, which is found inside the nucleus of eukaryotic cells. Chromatin exists in two forms: heterochromatin (condensed) and euchromatin (extended). The primary protein components of chromatin are histones that help to organize DNA into “bead-like” structures called nucleosomes by providing a base on which the DNA can be wrapped around. A nucleosome consists of 147 base pairs of DNA that is wrapped around a set of 8 histones called an octomer. The nucleosome can be further folded to produce the chromatin fiber. Chromatin fibers are coiled and condensed to form chromosomes. Chromatin makes it possible for a number of cell processes to occur including DNA replication, transcription, DNA repair, genetic recombination, and cell division. People often confuse these three terms: chromatin, chromosome, and chromatid. While all of those three structures are composed of DNA and proteins within the nucleus, each is uniquely defined. 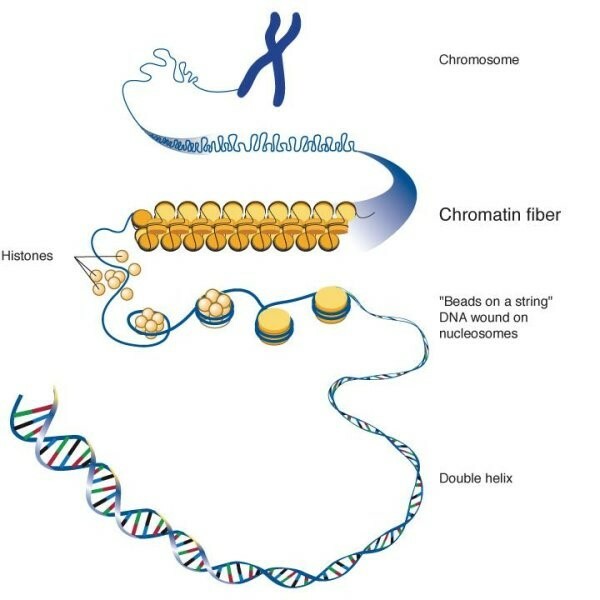 As mentioned above, chromatin is composed of DNA and histones that are packaged into thin, stringy fibers. The chromatin undergoes further condensation to form the chromosome. So the chromatin is a lower order of DNA organization, while chromosomes are the higher order of DNA organization. Chromosomes are single-stranded groupings of condensed chromatin. During the cell division processes of mitosis and meiosis, chromosomes replicate to ensure that each new daughter cell receives the correct number of chromosomes. A duplicated chromosome is double-stranded and has the familiar X shape. The two strands are identical and connected at a central region called the centromere. A chromatid is either of the two strands of a replicated chromosome. Chromatids connected by a centromere are called sister chromatids. At the end of cell division, sister chromatids separate and become daughter chromosomes in the newly formed daughter cells. This is the most fundamental function of chromatin: compactification of long DNA strands.The length of DNA in the nucleus is far greater than the size of the compartment in which it is stored. To fit into this compartment the DNA has to be condensed in some manner. Packing ratio is used to describe the degree to which DNA is condensed. To achieve the overall packing ratio, DNA is not packaged directly into structure of chromatin. Instead, it contains several hierarchies of organization. The first level of packing is achieved by the winding of DNA around the nucleosome, which gives a packing ratio of about 6. This structure is invariant in both the euchromatin and heterochromatin of all chromosomes. The second level of packing is the wrapping of beads in a 30 nm fiber that is found in both interphase chromatin and mitotic chromosomes. This structure increases the packing ratio to about 40. The final packaging occurs when the fiber is organized in loops, scaffolds and domains that give a final packing ratio of about 1,000 in interphase chromatin and about 10,000 in mitotic chromosomes. Transcription is a process in which the genetic information stored in DNA is read by proteins and then transcribed into RNA, and the RNA will later be translated into functional proteins. If the chromatin gets strengthened and restricts access to the read proteins, there are no transcription occurs. Euchromatin, an extended type of chromatin, can conduct the process of transcription. While heterochromatin, the condensed type of chromatin, is packed too tightly for DNA to be read by proteins. The packaging of DNA into the chromatin presents a barrier to all DNA-based processes. Due to the high dynamic arrangement of proteins and DNA, chromatin can readily change its shape and structure. Chromatin relaxation occurs rapidly at the site of a DNA damage, which allows the repair proteins to bind to DNA and repair it. 1. Comings D E. The structure and function of chromatin [M]. Advances in human genetics. Springer US, 1972: 237-431. 2. Widom J. Structure, dynamics, and function of chromatin in vitro [J]. Annual review of biophysics and biomolecular structure, 1998, 27(1): 285-327. 3. Mercer T R, Mattick J S. Structure and function of long noncoding RNAs in epigenetic regulation [J]. Nature structural & molecular biology, 2013, 20(3): 300-307.